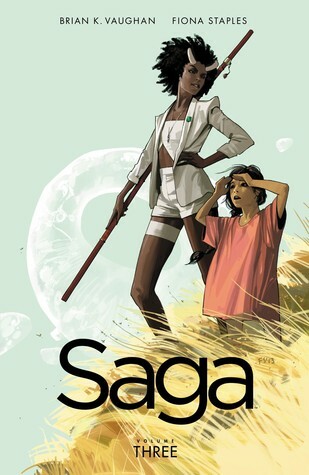 From the Hugo Award-winning duo of Brian K. Vaughan (The Private Eye, Y: The Last Man) and Fiona Staples (North 40, Red Sonja), Saga is the sweeping tale of one young family fighting to find their place in the universe. Searching for their literary hero, new parents Marko and Alana travel to a cosmic lighthouse on the planet Quietus, while the couple's multiple pursuers finally close in on their targets. I am confused now, did I read vol 2? And now when I search in the library catalog I can not even find this one! *headdesk* But it did not feel like I missed anything. I remember that space ship, and they were still in it...oh well. Two star crossed lovers being hunted across space. And they have a baby to protect. I always say it, but I cannot review graphic novels...what should I say? They are short, they can be read fast. Yes stuff happens, but but. Story: They meet an author. They try to live as normally as always. Good. Illustration: Yes, that part I find the most important. I really like the illustrations. They are awesome. Really really well made. I am going crazy, why doesn't this on exist at the library? I did try book 1 and liked it but it wasn't that awesome.